When Conventional & Complementary Medicine come together – Magic Happens! This team is the FIRST of it’s kind, where leading medical professionals have come together to work with a team of complementary health care professionals to offer the best in fertility care. 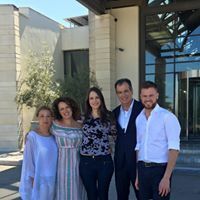 Dr. Elias Tsakos from EmbryoClinic had a vision of offering true holistic care many years ago; in April 2018 the first AlphaZita Fertility Retreat was birthed. WHY This Retreat is Unique! The holistic approach to fertility is of great importance to the assisting reproduction therapies. Mainly because, a variety of elements could be contributing to the fertility problems. Changes in lifestyle through life coaching or nutritional consultations, and holistic therapies such as acupuncture or fertility massage can promote fertility and greatly support patients in their journey to parenthood. A pre-conception retreat is a fine way of becoming aware of the supportive methods for assisted reproduction and identifying issues in every day life that might be emotionally toxic and also harmful to your general health status. The fertility treatment procedures, although necessary to achieve parenthood, might be very stressful. The amount of experienced stress and anxiety differs from one person to another. It depends on a variety of factors and cannot be controlled by “a one protocol suites all” method. All relevant therapies should be personalized in nature and frequency. Not everybody is in need of those therapies and not everybody who needs them requires all of them. The great benefit, besides the main reason for pursuing them- getting pregnant- is that you can carry the positive results and the lifestyle changes for the rest of your life. Another not less important reason is that the couples, who achieve effortlessly, have one less stress-test to go through. Their root to parenthood is mild and pleasant. The aim of the retreat is to provide you with such mechanisms to achieve positive thinking and protect your relationship as much as possible. The uniqueness of this retreat though, above all that, is the combination of these therapies with synchronous medical consultation. This holistic support is parallel with medical guidance to assure safety and personalization of the therapies offered. prepared for your journey to parenthood and explore all your options!